This is odd because cyclists in the know have always known that bagged bicycles on the train are perfectly acceptable. We've always garnered pained looks from station staff and passengers, but our presence has been tolerated as we're careful to be as unobtrusive as possible. 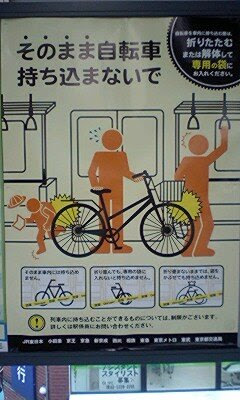 But your average Tokyoite has never considered taking their bicycle on the train. If they did then I can't imagine that they'd entertain the idea of rolling it on fully assembled as depicted the poster. Its unprecedented, I've never seen it and I'd wager a bet that 99.999% of the population of Tokyo have never seen it. If it were attempted the station staff would prevent the person from even reaching the platform let alone entering the train. Wouldn't they? So is the poster saying "Our staff are so lax and unconcerned for your safety and comfort that they'll let anyone old nutter roll a fully assembled bicycle onto the train."??? Petty criticism of the poster for my own entertainment aside, any education of the public is worthwhile. I don't believe there will be an influx of bicycle bag toting, grocery laden, obasan on our trains, thank god. But I do think that making it known to all that bagging your bike is perfectly within the rules of train etiquette us existing bike baggers may earn a few less stern looks from fellow passengers next time we bag it.